Hi guys! Thanksgiving is nearing the corner so that means I better get my booty into gear! Each year my family and I rotate the hosting duties and this year it is my turn to be the hostess-with-the-mostess! So let the menu planning begin! I absolutely love hosting because I get to pick the menu and make sure all of my favorite items are on the list! My mom did an ahhhh-mazing job at thanksgiving so I have so many memories and favorites. I don’t know how she did it but holy smokes did she put on a feast! I do have to say that I am pretty lucky because I married into an awesome family and all of the women pitch in and help. It always takes the burden off a little because I know they are taking care of the little items such as appetizers, rolls and some side dishes. That gives me more time to focus on the turkey and dessert! The best part! 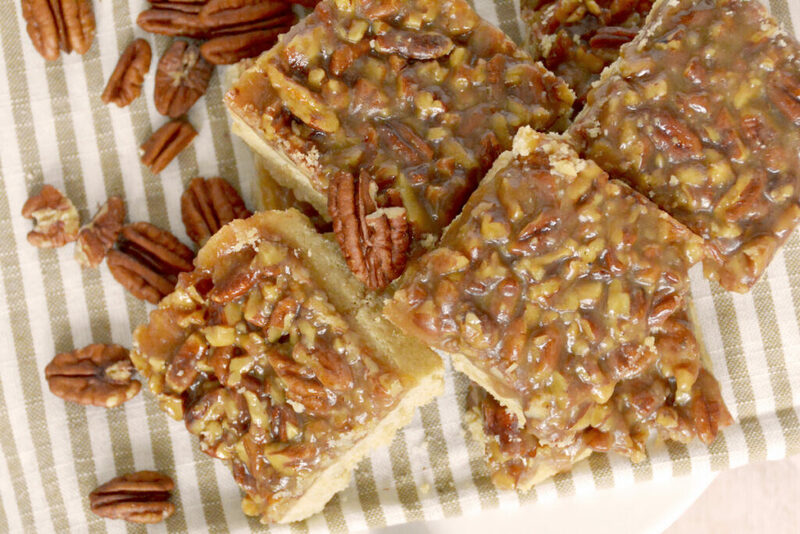 One of my favorite desserts that my mom used to make was always her homemade pecan pie. She made them from scratch each and every year! I have come to terms that with three little boys and a husband that is traveling with the bees this time of year I need to lower my stress and make things simple. 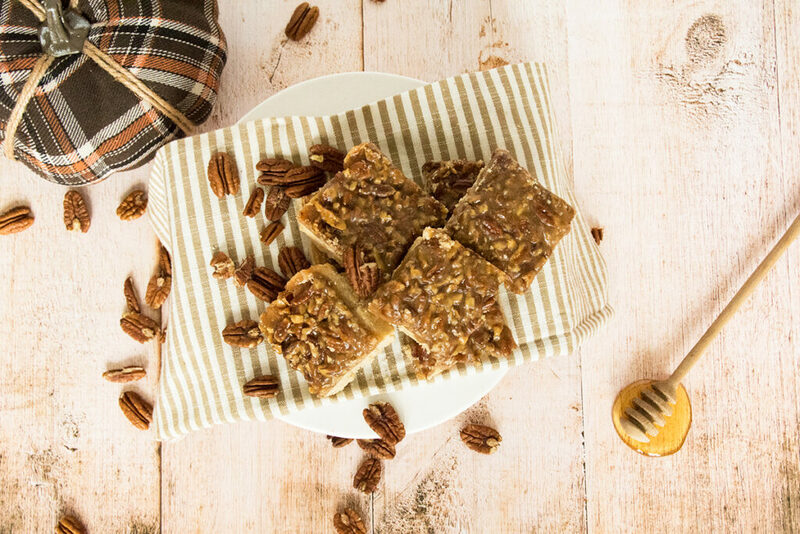 A few years ago I found this amazing recipe for pecan pie bars and I was really intrigued because it used honey instead of corn syrup! Double bonus! I gave them a whirl and they were absolutely delicious and tasted pretty close to my moms homemade pies! I kind of like having them in bars because I can nibble on them and not have a huge piece of pie. I hope you enjoy this recipe and it makes your turkey day less stressful! 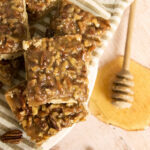 I want to bake these all the time because it makes your house smell like warm honey. My favorite smell on earth if you ask me! Thanks for joining me and let me know what you think! Delicious and easy! 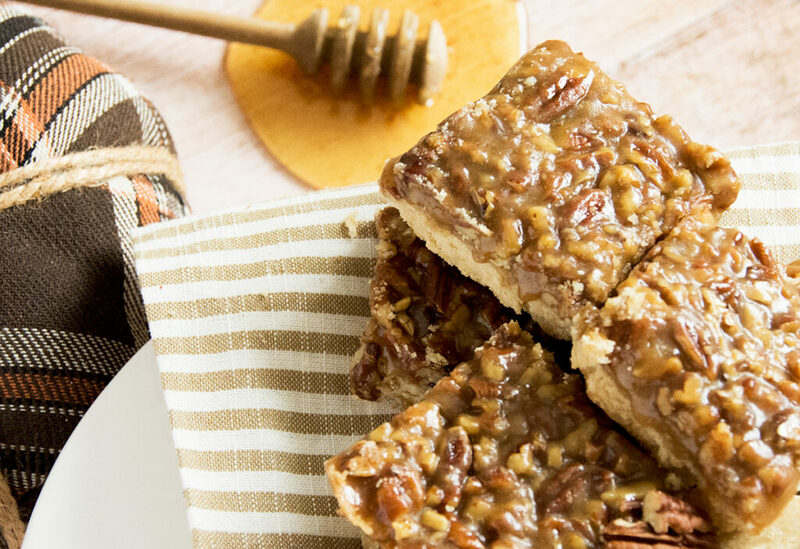 Made with honey instead of corn syrup! Preheat the oven 350 degrees and line a 9x13 pan with foil. Leave enough for a 2 inch overhang on all sides. Enough for you to be able to pull it out of the pan when it's all done. Start by making the crust. Cream together the butter and brown sugar until fluffy in a stand mixer. Add in the flour and salt and mix until crumbly. Press the crust into the foil-lined pan and bake for 20 minutes until golden. While the crust is baking start to prepare the topping. Combine the butter, brown sugar, honey and heavy cream into a saucepan. Stir over medium heat. Simmer for 1 minute then stir in the chopped pecans. Return the pan to the oven and bake an additional 15-20 minutes. Be careful not to over bake them! Use the foil overhang to lift out the bars and transfer them to a cutting board. 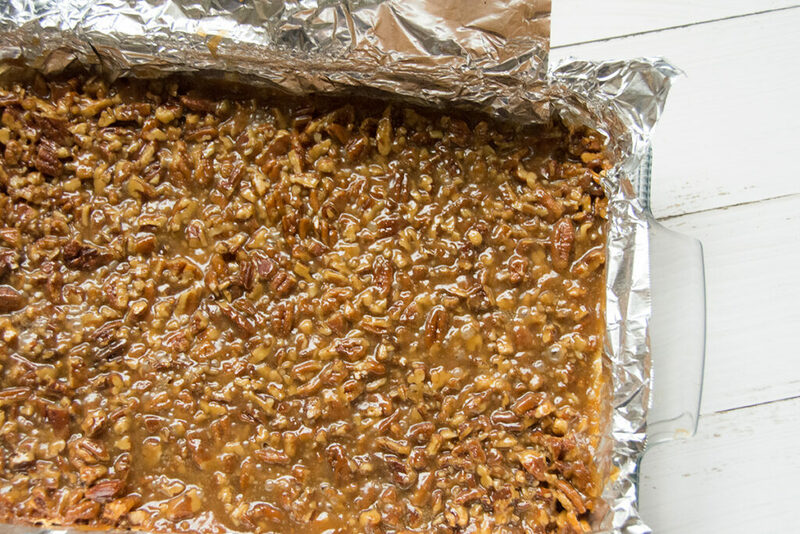 Peel off the foil and slice into bars! Enjoy!